Niamh is our Caribbean Travel Specialist and has an in-depth knowledge of all of the islands in the Caribbean. Niamh's qualifications are in the area of Business Management and Marketing with a Bachelor degree in Business Management and a Masters degree in Public Relations. 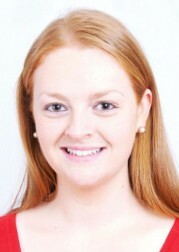 Niamh has worked for over 10 years in the travel industry and has also spent time working in the United States. Niamh spends a lot of her time travelling to the West Indies and personally inspecting each of our 5* properties. She has firsthand knowledge of each of the locations and villas that we feature. Niamh currently is our specialist for St Barths, St Martin and Anguilla. Niamh travels to these destinations every few months to personally inspect each villa and of course to view all the new villas to make sure they are of 5 star standard and suitable for our clients. "I am exceptionally fortunate to say that “I love my job”. I particularly love booking honeymoons, destination weddings, group and family travel and helping each client find the most perfect villa and destination to suit them. For me it is about making it more special and making sure the whole experience is seamless from start to finish. Whether a client just wants to relax somewhere quiet and secluded or a vacation full of activity please contact me and I can make your dream vacation a reality. "I think it is so important to be able to identify what each of our customers' needs are so that I can find them the perfect villa and ensure their vacation is a memorable one." This is such a tough one as I love them all but my favourites would have to be St Barths, St Martin and Barbados. All three are so different but I love the atmosphere in St Barths and how it is so chic and all about the fashion – it is great for celeb spotting too. I also love the beaches here and the villas are ultra modern and my clients always love it. St Martin is completely the opposite and is a much larger island in comparison to St Barths. I love how there is so much to do and how it is so easy to get around. My favourite spot on the island is Grand Case-. Here there is an excellent strip of restaurants with both casual and gourmet dining with the majority of restaurants offering stunning views of the ocean depending on which side of the strip you are on. Barbados was the first island I visited in the Caribbean so it will always be one of my favourites. It is so laid back and the prefect destination to have fun and just relax. I think there is something for everyone in Barbados. "Thanks so much for all of your detailed information Niamh. You are definitely the most helpful of all villa specialists I have been dealing with"
Julie, Niamh, and Jasmine: I wanted to thank each of you for the wonderful vacation we had in St Martin. The villa was perfect and everyone helpful in making our anniversary trip special. We definitely will book a villa through your company again in the future.